César Eugène Holzem, born 1971, completed his studies in law at the Johann-Wolfgang-Goethe University, Frankfurt/Main in 1996. Since 1999 he is appointed as attorney-at-law in Duesseldorf. 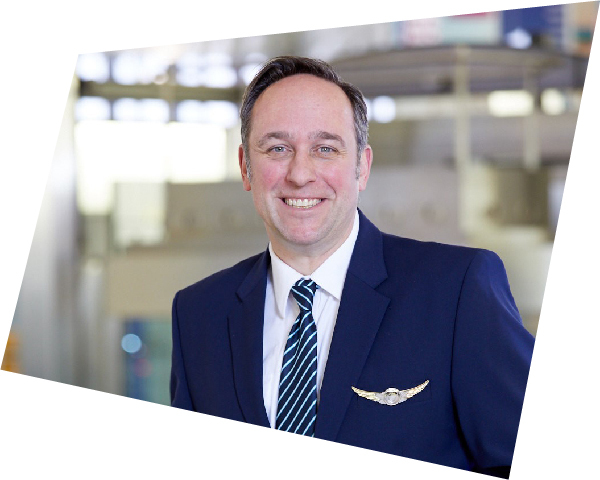 Since 2000 he concurrently works as an airline pilot, joining TUIfly, the German airline of the TUI Group, in 2003. He headed the Human Factors und Crew Resource Management (CRM) training section from 2011 to 2016. During this time he also lead two projects implementing the European flight time limitations (FTL) and establishing an approved fatigue risk management (FRM) system. Since 2016 he works as Senior Manager Flight Deck in the TUIfly flight operations department. In this function he is, among others, responsible for the recruitment and selection of new TUIfly pilots. He his a member of two flight time limitations expert panels at the European Aviation Safety Agency EASA, of the FTL working group of the European airline representation AIRE and of the “Operation & Safety” task force of the German aviation industry association BDL. He has published several treatises on human factor aspects in standard phraseology communication and pilot random substance testing as well as FTL and FRM provides training courses. Mr. Holzems presentation will analyse those impacts that such global threats as BREXIT, sanctions, tradewars and other bring to the life of an “average” pilot. Also Mr. Holzem will introduce non-EU pilots on the principles of obtaining work permits to succesfully work in European Union.